Late Friday, Apple and Google announced that the pair have settled all patent litigation between Apple and Google's Motorola Mobility. 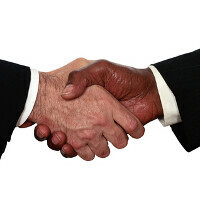 However, the deal does not include a cross licensing deal between the two firms. What might be more important is that both Apple and Google agreed to work together in some areas of patent reform. Google had acquired Motorola for $12.5 billion in 2011, but agreed to sell off the handsets business to Lenovo earlier this year. The majority of Motorola's vast IP library will remain with Google. While this agreement should lead to a dismissal of some cases that are still pending, it is not expected to have any impact on Apple's patent trials against Samsung. The first trial, during which Apple was awarded $930 million, is under appeal. The second trial, during which Apple was awarded $119.6 million, still needs to go through any post-trial motions. Despite Apple winning a small percentage of what it was asking for, Samsung has said that it will appeal that verdict as well. Apple and Motorola battled each other in court during 2010 when Motorola accused Apple of infringing on a number of patents including one that deals with how a smartphone work on a 3G network. Apple reciprocated with a suit accusing Motorola of using its patents. Both cases were consolidated into one in 2012, and dismissed by Judge Richard Posner, who said that neither side had enough evidence to win its case. But last month, an appeals court ruled that Apple can continue to seek a sales ban against Motorola, a ruling that is now moot thanks to today's settlement between the two companies. It's Friday night, nobody cares about this stuff right now. Settlement was probably a condition of the sale of Moto to Lenovo. 1 thing for sure apple don't want to go toe to toe with google. Just Samsung. If that makes you feel better, keep believing it. I can't believe you are delusional enough to think that Google is the big fish, and Samsung the minnow. Samsung is the bigger, richer company with many more patents. Samsung is Android. For me, personally, Android is Google, but it also means choices - yes, Samsung is the number one Android company, but, that does not make them the best. Over time, Samsung will not be the number one Android company, because there are simply too many choices out there in the world, in terms of Android phones. There is a reason Google insisted on the "Powered by Android" splash screen and changes to the way OEMs, but Samsung in particular, present Android: Samsung has become the public face of Android. People associate associate it with Samsung, and it shows in sales and global reach. Right or wrong, it is what it is. I guess you're the delusional one in this case. Doesn't showing "powered by Android" on the boot image kind of defeat the point that Samsung is strongly related to Android than Google? If people knew out was Android running the phone then Google wouldn't have bothered. The average person can't tell it's running on Android because it doesn't matter to them. That's Geek talk. That's because Samsung is a behemoth in electronics and uses android for its smartphones. People trust Samsung. People even trust Nokia, but why are not lumias selling like Galaxies, the platform makes the difference. I don't know if your reply was for comment . But I did not say google is the big fish in my statement. Anyways I respect your views about what I said. What does that have to do anything with what I said? Did you see me ever mentioning Samsung? Thanks for showing me that either for a fact you're; 1. A Samsung fangirl (in that case someone should get you a pair of pom poms), or 2. just being retarded and waiting to pounce on anything that remotely relates to anything Samsung, or 3. Worryingly enough, both. Okay, ignore this comment altogether. I replied on the wrong post. No more law suits. Compete with better products and sales please. Wait until some company patents the patent. Then we are in for the great patent troll war of all time. But maybe after everything is dead, we will not decide to use the terrible 'patent' concept again. Well, it's nice that they settled. Both sides probably realized that a sure win was just not going to happen, and would cost more than it was worth (especially since sales of the devices in question are long since dead anyway). I suspect that the only reason Apple continues to attack Samsung is because they keep getting to add new devices to the lawsuit. Google don't make much hardware. Cost and profit ratio is way off for Apple to consider a direct strike at Google. Besides Google is a US base company with their own patents arsenal and political influence. WHOA!!! Sniggly is in the HOUSE!!! This is good news, and should be great for the industry on a whole. Maybe now, all of the other OEM's litigating against each other will follow suit. It would be nice is Apple and Samsung could follow suit, but the may be more along the lines of wishful thinking. This is good news, but it's more about strategy than peacemaking. Samsung demonstrated pretty effectively in the most recent trial that Apple's suits against it are actually stealth attacks on Android. It's an attempt to mitigate this.